If you’ve been following Rosanne Hewitt-Cromwell’s journey from blogger to published author over the past year you know how much of herself she has poured into this book. I received a copy of the book from Mercier Press a couple of weeks ago and now it’s time to give you the Like Mam Used To Bake review. My mother was here the day this book arrived on my doorstep and she promptly picked up the cookery book and leafed through it. There were many “oohs and aahs” and murmurs of approval. When my own Mam asks for a lend of a book as soon as I’m finished with it you know it has to be something special. One of my sisters sent me a picture of this book sitting beside Mary Berry in Easons bookstore last week; another got a copy on Friday and I’m reliably informed she is dying to make the marshmallows. Every single person who has picked up “Like Mam Used To Bake” from the bookcase over the past couple of weeks wants to bake something from it. The book is achievable, not baking that requires loads of equipment. It takes family favourites from the 80’s and breaks the recipes down to easy to follow steps. As a regular blog reader I know that this book is an extension of the Like Mam Used To Bake blog, full of Rosanne’s wit and passion for her family. It is also a wonderful testament to her mother, who sadly passed away when she was younger, for her daughter inspire a baking passion in a new generation. The best example of which is the fact that our 14 year old wants to bring the book to school to show to her Home Economics teacher, because she would like to cook from it for her Junior Certificate exam. 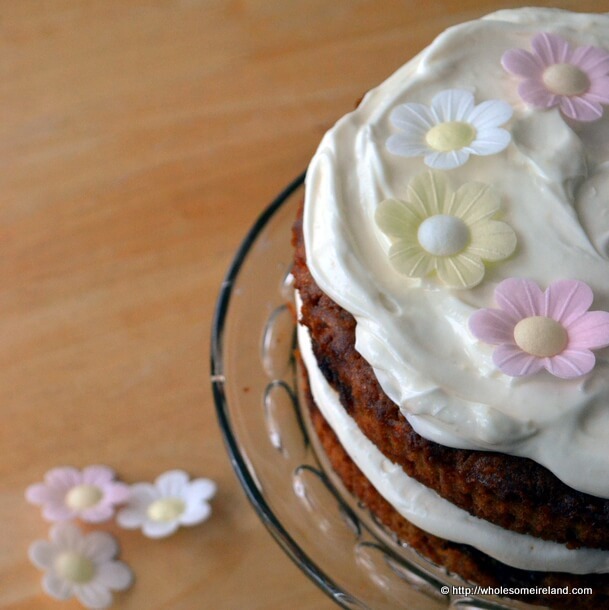 To test the book out, yesterday I baked the Carrot Cake recipe (pictured) and it turned out beautifully moist (is it okay to use this term after the Great Irish Bake Off?) and melt in the mouth. I’m afraid in order to try it out for yourself you’ll need to buy the book from all good bookstores all over Ireland, on Amazon or directly from the publisher – Mercier Press. I believe it is the Mercier book of the month at the moment and as a result you can get a significant discount & free shipping if you order directly from the publisher. 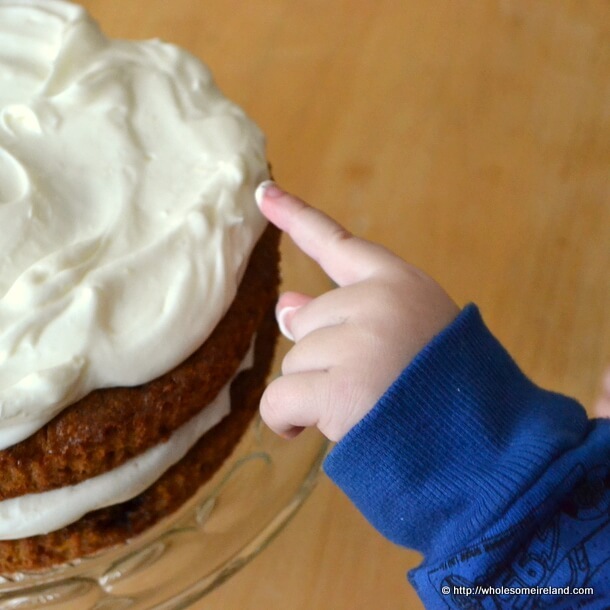 PS: I captured the toddler sticking his finger in the frosting when I had the camera on time delay yesterday. His favourite word at the moment is “cake”. I’m including it as proof that things are not always perfect in my house! writing about the book – I will look out for it at my local bookstores. Do & if you can’t find it in your local bookstores, you could consider ordering on Amazon.